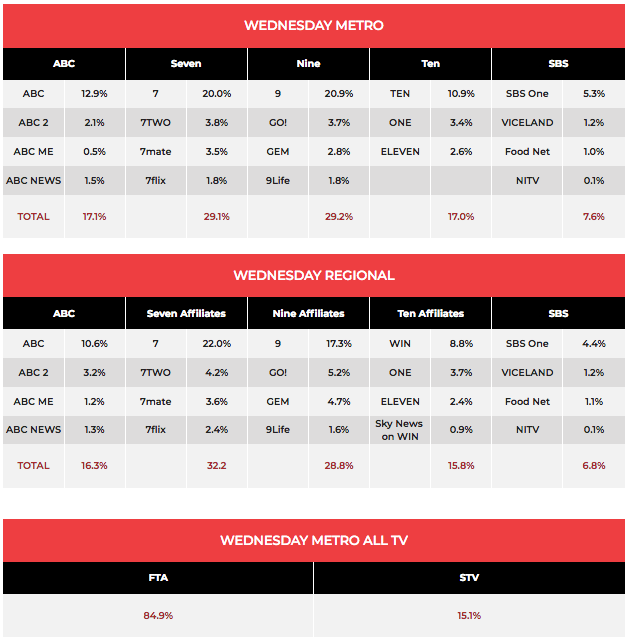 After dipping from close to 700,000 to 600,000 at the start of the week, Home and Away Wednesday was on 644,000. Highway Patrol then did 529,000, followed by Beach Cops on 544,000. Among the rescues was a dog from a car in the hot sun. Another episode of the US drama about ob doc stars, 9-1-1, followed on 502,000. Jennifer Love Hewitt plays a 911 operator in the series which recently launched season 2 in the US. 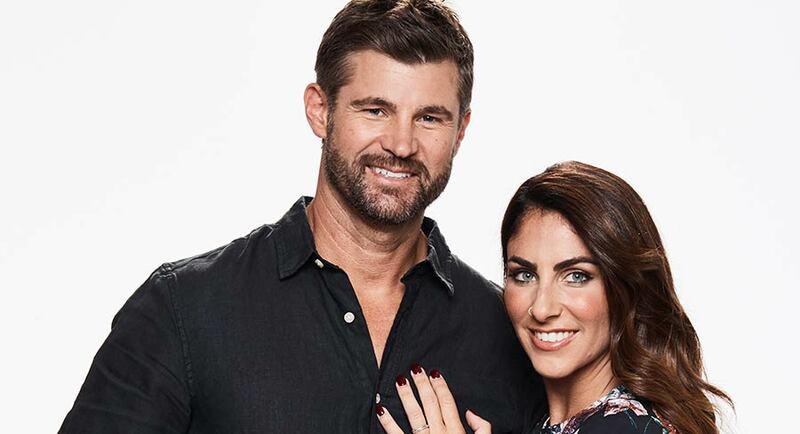 With regular host Tracy Grimshaw shocking advertisers with her behaviour at the Nine Upfront last night, guest host Leila McKinnon took over A Current Affair. After confronting The Honey Badger in Papua New Guinea, reporter Reid Butler found a gold-digging granny last night. After audiences of 815,000 and then 759,000, Wednesday was on 729,000. The Block was front and centre at the Nine Upfront too with host Scott Cam explaining next year’s building, just up the road from The Gatwick, is nearly twice as big. With only a few days before the reveal of the challenge apartment final rooms, the Wednesday edition did 921,000 after 917,000 last week. The second episode of the US missing plane drama Manifest then did 545,000 after launching with 659,000 a week ago. On The Project Nigella Lawson was speaking from London while the show’s royal reporter Anne Edmonds was following Harry and Meghan. The midweek episode did 463,000. The Bachelorette did 544,000 after launching a week ago with 631,000. Playing For Keeps was on 359,000 after 377,000 last week. Madam Secretary then returned to the schedule with 134,000. Good numbers at 8pm with Hard Quiz pushing just over 700,000 after 688,000 last week. 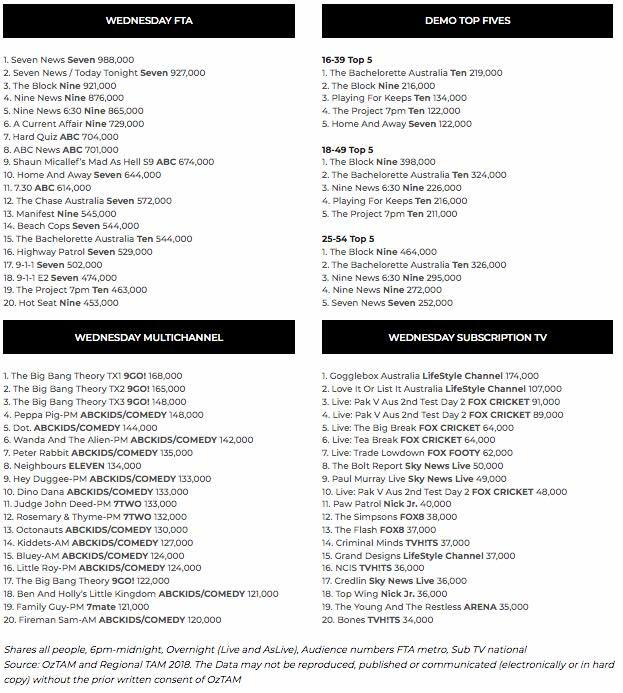 Shaun Micallef’s Mad As Hell was also up week-on-week – from 647,000 to 674,000. A repeat episode of Great British Railway Journeys did 247,000. Food Safari followed on 155,000. The 8.30pm slot was Albert: The Power Behind Victoria, which promised the untold story of Prince Albert. It pulled 186,000 despite the story being told quite a bit of the past couple of years.